Having spent 25 years working in the world of theatre as the Artistic Director of a women’s theatre company, and as an independent performer, producer and teacher, Naomi offered for ministry in 2011, trained at The Queen’s Foundation in Birmingham and came to Bethesda in August 2014. She says: “The community at Bethesda is seeking to celebrate life in all its fullness – its joys and its sorrows, and to travel deeper into exploring the mystery that is God. Much of the time, our understanding of God’s grace, abundance and inclusive love finds expression through food and creativity, both in worship and beyond! 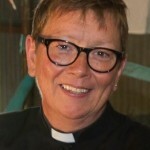 Rachel Simpson is the Lay Worker for Hospitality and Pastoral Care at Bethesda. She works alongside many of the groups who meet at Bethesda and oversees all bookings. When she’s not in the building Rachel is out and about, building relationships with the local community of the Bath Road. She also supports Naomi with Pastoral Care. Throughout the year the elected church council meets to oversee the life and work of the church and to hear from various appointed committees each of which have their own area of responsibility. Bethesda Methodist church, Cheltenham, is one of the 46 churches that comprise the Gloucestershire circuit which covers almost the whole of the county. Whether large or small, circuit churches seek to support one another in their ministry and mission. Ministers have pastoral charge of a number of churches, so Local (lay) Preachers also lead worship throughout the circuit. The Gloucestershire circuit is part of the Bristol District, which includes South Gloucestershire and parts of Somerset and Wiltshire. Districts also offer support and oversight, meeting twice yearly for representative Synods for lay and ordained, and once a year for Presbyteral Synod. There are 31 Districts which form the British Methodist Connexion. The Methodist Conference is the ruling body of the Methodist church. It comprises lay and ordained representatives from all the Districts and is held annually. Here decisions are made which affect the whole of the Connexion. The Connexional offices are in London, offering advice and support on a whole range of matters from law and policy, faith and order, finance and property, to training, mission and ministry and all other aspects of Conference decisions. Linked to one another across circuits, Districts and to the Connexion, Bethesda is therefore not an independent church, but is connected in a very real and supportive way to the whole of the Methodism. John Wesley, whose evangelical movement within the Anglican church led to the formation of the Methodist church, instigated an annual Conference and local circuits, so it is in that tradition of Connexionalism that we stand here at Bethesda.